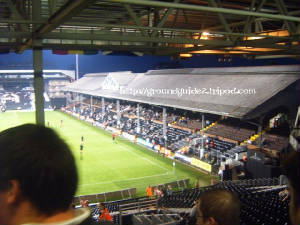 Craven Cottage was easily one of the worst grounds in the League. However, that was before they got into the Premiership and were forced to redevelop the ground. We had drawn the Cottagers in the 2nd Round of the Carling Cup. 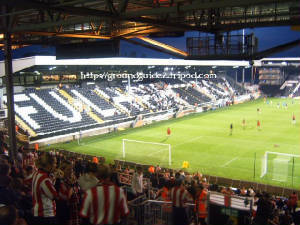 It had been 6 years since we’d visited Craven Cottage and that was for a league game (how times change). The kick off was due for 7:45pm and we actually got to London at around 5:30pm, however, it took us 2 hours to get through the middle of London. During those 2 hours, we saw at least 10,000 Londoners and not a single one was smiling, infact, the only person we saw smiling in the whole of the London area, was a bloke on a National Express coach from Birmingham to London. We finally arrived at the ground about 20 minutes before kick off and we went immediately into the ground. 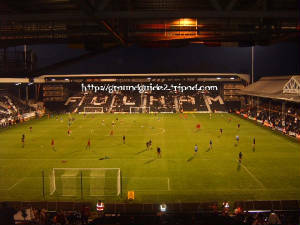 Fulham had spent 2 years developing the ground, we got there and all it was, was a 4-5,000 all seated temporary stand and I absolutely hated it. There were over 1,000 Lincoln fans and the stand didn’t feel well supported and often felt like it was going to collapse. However, the stand did offer a great view of the action and had the potential for a really good atmosphere if the stand was full. Looking out from this stand, it was a rather poor for a Premiership ground. The stand opposite was exactly the same as the one with the away fans in. The stand to the left was an elevated stand and was actually fairly nice. The final stand to the left, was easily the oldest stand at the ground and easily the worst. 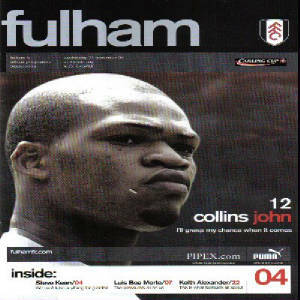 The atmosphere at Fulham wasn’t the greatest back in 1999 and the lack of atmosphere in 2005 wasn’t that great either, then again, that could have been because there were little over 4,000 Fulham fans in the ground for a game they viewed as not mattering. Overall, I enjoy a trip to Fulham although I would seriously recommend the use of the underground. I would definitely go again if I got the chance, although I wouldn’t sit in the temporary stands again.